This book is a study of reverse anachronisms. These are the 'disturbing' incidents where objects, beliefs or practices from the present or future turn up in the past. There are many such incidents (and the author sets out about forty of them) which make us wonder whether there is some kind of causal link, as opposed to straightforward luck or synchronicity. Lamont Wood's tongue-in-check narrative plays with exotic explanations, e.g. visiting aliens, pre-cognition or time travellers. But his general conclusions are more prosaic. His journalistic background shines through here: snappy, concise prose full of wit and healthy cynicism. It's certainly enjoyable reading, but he toys precariously with his target audience, especially with his fairly high-brow indictment of Ufology. The reverse anachronisms that are on most solid ground are technological in nature. 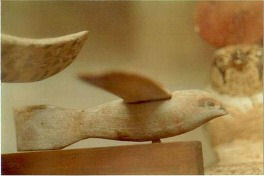 Wood looks at a number of examples, both from the ancient world and more recent times. Computing is a running theme, with the ancient world's anomalous Antikythera mechanism topping the bill. It's clear that neat little mechanical computers were invented in the Graeco-Roman world to calculate various celestial data, although they certainly weren't in widespread use. The evidence is solid enough- the reasonable presumption is that the flowering of learning and knowledge in that enlightened period brought about innovative technology created by such geniuses as Archimedes. Progress was then lost through war, lack of academic interconnectedness, and the religious persecution/destruction which led to the Dark Ages. In a similar vein, theories are suggested, countered, and then the counter-arguments are countered. This approach by the author creates balance and thoughtful discourse. All angles are covered. Until, that is, the author encounters the theories of Robert Temple (unnamed in the text or bibliography), where he vents his spleen. There is good reason to be careful of the Dogon/Sirius material, of course. Cross-contamination of information about the Dog Star could have infected that insular sub-Saharan community before the arrival of the French anthropologist Marcel Griaule's in the 1940s (rather than an anthologist, which means a compiler of anthologies (p100)). Griaule's scientific methodology is also open to debate. But the author's irate dealings with this mystery is uncharacteristically one-eyed, and irks. Comparatively, the Sirius Mystery is no different from many of the other fascinating anomalies explored in this book. Where the author shines is in his discussion of I.T. innovations before their time. His grasp of the technologies is sound. He fondly describes Charles Babbage's 19th century computer technology in England, aided and abetted by the brilliant scholarship by Ada King, an aristocratic daughter of Lord Byron. Equally impressive is the remarkable vision shown by Vannevar Bush about information retrieval and storage, and the Internet. 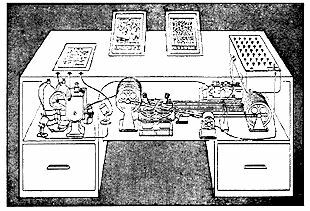 His detailed propositions for a Memex were made in 1945 (pre-Roswell, note, so no Philip Corso-like conspiracy here...). What particularly struck me was his description of dual-screens on office desks, whose use is standardised in Intelligence-gathering environments (in Chapter 3 of 'The Followers of Horus'). Given Bush's background, that seems remarkably prescient. The hunt for the earliest computer innovators continues into more modern times, taking us to Wood's own town of San Antonio where a fledgling company beat Silicon Valley at its own game - perhaps not a reverse anachronism, but entertaining nonetheless. A proud Texan, the author takes a side-swipe at California's technological hegemony. It's possible that the reason Lamont Wood wrote this book was to take on the alleged appearance of flying saucers in certain old paintings. His scepticism is well-placed. The painters of these controversial works were no esotericists, nor were there contemporaneous descriptions of UFO flaps in their locales. Simply, the UFOs in the paintings are iconographic. The author uses art history to prove his case well. A point he fails to address, however, is whether the traditional religious iconography in question is itself derived from experiences with UFOs and/or extraterrestrials. In other words, is the actual concept of visiting angels derived from the Nephilm of the Bible, or the Anunnaki of earlier Mesopotamian lore? Is that why angelic hosts are depicted in ways that seem akin to UFOs? The author's attitude towards the Dogon question indicates the answer, but I think it is a worthwhile line of questioning in this context. The final section of the book looks at anomalies in the solar system, particularly among certain moons - Iapetus, Phobos and Deimos. Very interesting reading, with questions definitely left unanswered. The author explores how Jonathan Swift managed to so accurately predict the existence and weird properties of the tiny Martian moons back in 1726. Despite the rational explanations on offer, one wonders whether there is some kind of visionary experience underlying many of these accounts. Seers are not included in this book, but is there some kind of clairvoyance, or remote viewing in modern parlance, at work here? I say this because of my own experience of this with my novel 'Ezekiel One', where my depiction of the owner of The London Evening Standard by a Russian oligarch presaged that very same event by a year. It was a shock to everyone when a British newspaper was taken over by a Russian, yet there it was in my published novel. How did I see it coming so accurately? Having personally experienced a 'reverse anachronism', I'm still no better placed to give an entirely rational explanation than Lamont Wood in his detailed and enjoyable book. Perhaps that's why the subject is so fascinating. 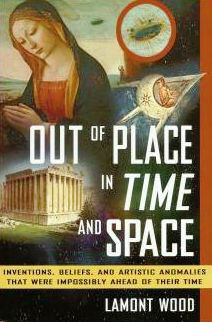 Subtitled "Inventions, beliefs, and Artistic Anomalies that were Impossibly Ahead of their Time"